A little game called Air Penguin is beating its more widely known avian competition for the top spot in the iTunes paid apps chart these days. Air Penguin's hotter than Tiny Wings and topping Angry Birds. The Korean-developed penguin game from Gamevil and Enterfly does several things right. • It's simple. 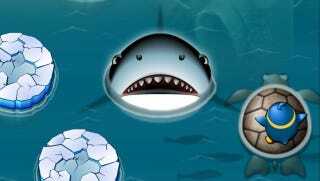 You control an Antarctic penguin who must hop, slide and turtle-surf over and past various ice floes until he reaches a goal flag or dies trying. The courses scroll down the length of the iPhone. Unless you've purchased items using the game's fish-food collectibles, falling in the water is death. Falling into a shark's mouth is death. Falling onto a cracked ice floe is death. No worries. You can retry in the blink of an eye. • It's easy to play while on the go. You get the penguin through them by tilting and jolting the controller, letting you play one-handed while riding the bus or holding onto an umbrella in a rainstorm. The penguin bounced on ice floes, ascending into the air where you have a high amount of control to then either nudge him a little forward with a small tilt or send him far ahead with a more severe dip. When the penguin is sliding across a snowy iceberg, you tilt left and right to steer him, dodging walruses. When you surf a turtle, you do much the same thing. • It's mostly cute. The penguin, the sharks and even the icebergs have a nice plump cartoony look to them. The game's mostly blue and white, giving it a clean, bright tube-of-toothpaste aesthetic. That makes the game a visual pleasure, though its jolly, fast-looping music prevents it from being an aural one. • It's got the right hooks for endless play. While you can play the game's story mode, which is a series of goal-based challenges, you can also get a Canabalt or Doodlejump effect by switching to an endless mode and seeing how far you can send your penguin. With dashes of Super Monkey Ball and Doodlejump that make it feel more like a good twist than a great new idea, Air Penguin is cute enough and fun enough to deserve some time high on the charts. It's a pleasing game for a buck. If you need a new iOS diversion, give it a shot.